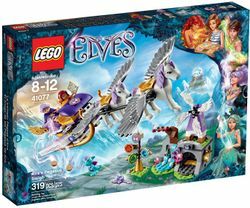 41077 Aira’s Pegasus Sleigh is an Elves set released in 2015. Fly up to the sky in a magical sleigh pulled by flying horses! Build a flying sleigh with Aira Windwhistler, the Wind Elf! Fly up to the clouds pulled by Starshine and Rufus, the 2 pegasi to help the LEGO® Elves find the magic wind key they need to send their lost friend Emily Jones back to the human world. Load up the chest with cookies for the journey and then follow the magic map with Aira and Azari Firedancer, the Fire Elf, to an ancient windmill in the sky. Miku the baby dragon has the last key, but how will the elf friends get it from her? Help Aira muster her magic wind powers to blow cookies towards Miku, and distract her long enough to grab the key. Includes Aira Windwhistler and Azari Firedancer mini-doll figures, plus Miku the baby dragon and 2 pegasi: Starshine and Rufus. Build a magical Pegasus sleigh to fly up to the clouds! Facts about "41077 Aira's Pegasus Sleigh"
This page was last edited on 22 January 2016, at 14:56.